People were always saying that our son, Reef, looks just like Charlie Brown because of how round his head is and because for a long time the only hair he had was a couple little curls on top. So, when we started thinking about what he should be for his first Halloween, Charlie Brown was the obvious choice! 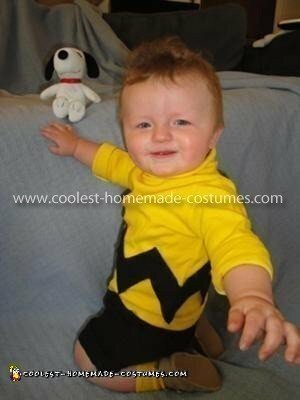 The Homemade Baby Charlie Brown Costume idea was simple but actually finding everything we needed wasn’t. We had to hunt down black shorts, a white shirt and white socks (because we couldn’t find them in yellow) and then dye and glue gun! In the end it all came together really well and we think he looks great!